So far most of the attention in the 2010 Chess Olympiad in Khanty Mansiysk has been focused on the chess board but that may change soon as the FIDE elections rapidly approach. Held every four years the elections are not only for President but many other positions. 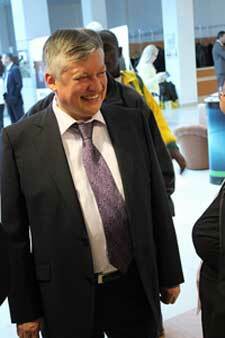 The FIDE Congress will also be deciding the host of the 2014 Chess Olympiad – either Albena, Bulgaria, or Tromsø, Norway. Understandably the lion’s share of attention to date has been focused on the Presidential election where incumbent Kirsan Ilymzhinov, who has held office since 1995, is running against former World Champion Anatoly Karpov. FIDE elections see candidates running on slates so it is not simply Kirsan versus Karpov and in fact, while the USCF has officially endorsed the latter for a long time, the US actually has candidates on both sides. USCF member Richard Conn is on the Karpov ticket and former USCF President Beatriz Marinello is on team Kirsan. The latter was considered a highly desirable addition when FIDE made the requirement that at least one women needed to be on each slate. American-born WGM Alisa Maric of Serbia fills this requirement for Team Karpov which has Gary Kasparov and former USCF President Max Dlugy actively campaigning for it in Khanty Mansisysk. Conventional wisdom says don’t bet against Kirsan, who claims support from 90 countries (putting him well over the top with about 150 voting), but remember the voting is done by secret ballot. Team Karpov is definitely counting on support from those who are fearful of publicly going against Kirsan but want change. Whether there are enough of these countries remains to be seen. What is clear is that both sides are still campaigning feverishly and taking nothing for granted. The contrast between this election and those witnessed by this author in 1996 and 2006 is that it appears that it will go to a final vote. Previously Kirsan has been able to reach some sort of accommodation with his rival prior to the election but that seems extremely unlikely here. The battle to head the European Chess Union is also quite heated with three different slates battling it out with no clear favorite. Interestingly enough some well-known chess players are among those running including former World Championship Candidate Johan Hjartarsson of Iceland and many-time Russian Olympiad team member Evgeny Bareev. Adding to the election color former USCF Executive Board member Sam Sloan arrived in Khanty Mansiysk yesterday although it remains unclear in what capacity he is attending the proceedings. About the only thing that seems certain is that the 2014 Chess Olympiad will be in Tromsø as the Norwegians have an extremely strong bid. 6.Treasurer - Mr. Nigel Freeman nominated by Bermuda. *- Bill Goichberg of the USCF board writes, "Ilyumzhinov does not have a nomination from Argentina, which has endorsed Karpov. Karpov and Ilyumzhinov both claim the nomination of Russia. A meeting of the board of the Russian Chess Federation nominated Karpov, after which the chair, an ally of Ilyumzhinov, declared the nomination invalid because the chair was not present! He could easily have been present, but knowing he would be outvoted, chose to hold his own separate meeting instead. I believe that Russia is probably supporting Karpov but the truth is, we really don't know for sure." Photos by Tony Rich of the Chess Club and Scholastic Center of Saint Louis.